Nemanja Bjelica (8) shot 41.5 percent on three-pointers last season. Nemanja Bjelica's tenure with the 76ers ended before it even started. The 6-foot-10 Serbian forward informed the team Tuesday morning that he wants to remain in Europe this coming season. 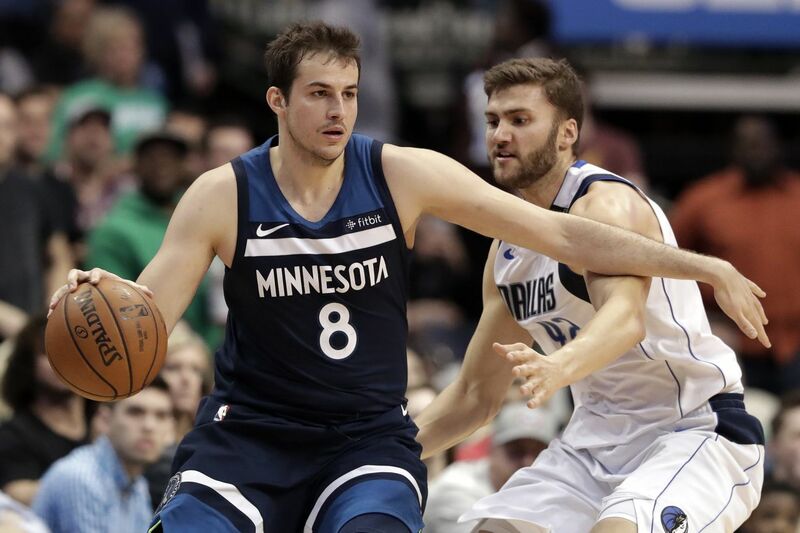 Bjelica played for the Minnesota Timberwolves the past three seasons and reached agreement July 5 with the Sixers on a one-year, midlevel exception for $4.45 million. Bjelica flew to Europe when the Timberwolves' season ended and was scheduled to have a physical with the Sixers last week. The team said that visa complications prevented Bjelica from taking the physical. The 30-year-old was looking for a better deal with more years than the one he agreed on with the Sixers, EuroHoops reported. Bjelica also said he thought staying in Europe would be best for the family. "It's not about the coach [Brett Brown] of the Philly organization," he told The Athletic. "Brett Brown, he's a great guy and a great coach. The most important thing for me is family and some kind of stability." But this is a bad look for a Sixers team that was unable to lure either of its coveted free-agent targets, LeBron James and Paul George. James signed a four-year, $153 million contract with the Los Angeles Lakers. George signed a four-year, $137 million deal to return to the Oklahoma City Thunder. Freeing up cap space to get James or George, the Sixers rescinded their rights to JJ Redick, Amir Johnson, Marco Belinelli, and Ersan Ilyasova. They eventually re-signed Redick and Johnson to one-year deals. But Ilyasova (Milwaukee Bucks) and Belinelli (San Antonio) returned to two of their former teams. Bjelica was supposed to take Ilyasova's place as a sharpshooting big off the bench. The Sixers were also impressed that he was versatile enough to play small forward. He averaged 6.1 points and 3.8 rebounds during his three seasons in Minnesota. Bjelica averaged a career-best 6.8 points this past season while shooting a career-best 41.5 percent on three-pointers. He became an unrestricted free agent after the Timberwolves rescinded their qualifying offer to sign Anthony Tolliver. The Sixers did acquire Wilson Chandler in a trade with the Denver Nuggets this offseason. That deal is regarded as a salary dump for the Nuggets. They made the move to maintain financial flexibility and reduce what would have been a $50 million luxury tax bill. The Sixers, however, view Chandler as someone who can help them make another postseason run. He can guard multiple positions and will be a solid sixth man. The 6-foot-8 forward is set to make $12.8 million in the final year of his deal. In addition, the Sixers are still trying to trade for Spurs forward Kawhi Leonard.